I was recently attending a book signing event at a local marching band festival, hanging out under a hyperlink blue tent, eating Swedish Fish with my mom. Yes my mom. She's my biggest fan. Not in physical size, but in heart. (Let's face it, most of the time us band people aren't known for our Pilates routines and South Beach diets. Good thing we get a waiver for P.E...in some states.) We were discussing the bee situation there. They were everywhere. Another band mom told us to put a ziplock bag filled with a little bit of water and a bunch of pennies on the table. That should deter the little buzzers. We tried it...it didn't work. I still think she was just messing with us. A young lady who was a sophomore clarinet player, but adamant that I know she played E-flat clarinet during concert season, came up to me with her own mother (way larger than mine but I'm sure just as loving :) The ladies were very delightful and seemed to genuinely like my book, laughing at the illustrations and reminiscing about some of the people in their own band. But then something interesting happened. The girl said, "Band Nerds Poetry From The 13th Chair Trombone Player? You shouldn't call us 'nerds.' We're band GEEKS! Nerds aren't cool." Then her mom continued, "Yeah, 'nerd' is kind of negative." They continued to discuss how poor my title was with each other right in front of me. I found it extremely funny but gazing over at my mom, I could see her with "the look." You know the look, like a defensive mother falcon ready to rip off the face of any threatening predator with her talons. So I did the same thing I do at family holiday dinners when things are about to get awkward...started making fun of my brother. "Hey mom remember when Scott first tried on his quads and he fell over...wasn't that funny...eh?....eh?.... 'cause he's so short...eh?" (Please oh please oh please work.) There was a moment of silence where I wasn't sure what was going to happen, but then her face relaxed as she pictured my brother as a kid again. Talons retracted, and battle of the band moms was avoided for another day. The young girl and her mother ended up buying a copy and asked me to sign it, "Rock on Band Geek!" Which I did. My mom went and got more Swedish Fish. This of course got me considering a few things. One, moms are ridiculously funny if you think about it. And two, why were the ladies so particular about being called a "nerd" versus a "geek?" I mean, it's not like there's a ton of difference between them, like "Band Super Loser-face" and "Band Awesome Popular Deity." I remembered reading an article about Geeks vs. Nerds in a technology magazine. (Yep, I just keep getting nerdier....or geekier?...Ahhh!) They defined "nerd" as a more intellectual type of term and "geek" having a more social implication. According to this article the word "geek" started as a negative phrase 50 years ago but since has become more popular and sometimes a preferred compliment, as in "geek chic." "Nerd" has not come as far. To this, I think the young lady and her mother have a great point! Not that I would change the title if I had to do it over again. So here we come to the real discussion. Geeks vs. Nerds and what the words really mean. I say they describe which aspect of the activity you identify the most with, music or band. Those two categories represent either end of what I call the musical identification likability spectrum or MILK spectrum. Much like the political spectrum, according to the MILK spectrum (I'm sorry, I have to pause for second. "MILK," THAT is hilarious) most band participants fall in the center, but also like politics, there are people on the far left and right. For, um, scientific-y examinational analysis discussion-y stuff, I'll talk about the extremes. There are some in the band community (and I say "community" not "participants" because parents, businesses, teachers, etc. also are included) who really identify with being in a band. They love what it does for the individual. People learn to work together, become family-close, and form an identity as part of a band. And with identity comes a sense of belonging, then pride. Our beloved George Parks (who deserves more than just a mention, but saving that for when I feel I can do him justice) said it best, "Eyes with pride!" No other battle cry can be used to describe "band geek" in the best sense of the phrase. Every band geek cherishes hanging out in the band room after school or having t-shirts made for their section that are usually slightly inappropriate (Hint: Your director is laughing on the inside). They're excited to run the blog "pimpmyclarinet.com" and are the first to buy that purple instrument you only see in catalogues. The group is what gives the individual strength. That is what a "geek" identifies with. On the other side are the members of the band community who really love to live music. They have dedicated their lives to the study of music like mastering a language. There's a purist attitude that can sometimes be misconstrued as snobbish but really is rooted in a different kind of pride. They tend to be really good players. They are good because they focus on the intellectual aspect of band, which happens to be music. Their brains latch on to the making of music. There is a certain amount of awesomeness that comes with knowing music theory. I envied the dude who played trumpet, piano, and violin all at an All-State level. Although sometimes felt he would have been just as awesome as a starting short stop. He would know the game in and out, quoting to the umpire an obscure bat weight rule that would cause the person at the plate to be called out immediately and end the inning. (True story, then I got beaned my next time up at bat. No better metaphor for my life...wah-wah). The individual is what gives the group strength. Nerd. I have a theory that the old phrase, "music makes you smarter" is true due to the combined positive effects of being both a geek and a nerd. Just came up with it. Pretty sweet right? Can't wait to be quoted for my MILK spectrum and Geek/Nerd Theory. Now I don't know if music and band make your IQ higher, but I was never a big fan of the intelligence quotient anyways...it sure didn't explain how I got through high school. But I do know some very successful people that both loved music and identified with being a band participant. Balance in my opinion is key. 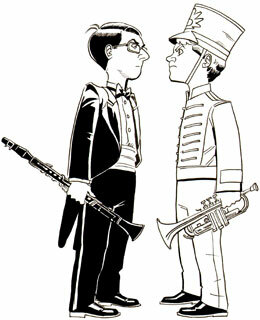 I want to be called a Band Geek-Nerd or a Nerdy Band Geek (whoa that's a doozie). Quick thought that could be a column in itself and should stir some conversation: Director Geeks, don't get so caught up in band pride you forget to teach music. Director Nerds, having an entire dynasty of All-State players isn't always the best thing you can do for your students and parents. Discuss. About the Author: DJ Corchin is author of the celebrated humorously inspiring book, Band Nerds Poetry From The 13th Chair Trombone Player (bandnerdspoetry.com). He was a featured performer in the first national Broadway tour of the Tony and Emmy award winning show, BLAST! where he was best known as the "unicycling trombonist." His new children's book, You Got A Boogie (yougotaboogie.com), was recently published to rave reviews. A pop recording artist out of Chicago and former high school band director, he continues to be involved in marching bands and music education through speaking events, competitions, and organizations such as Music for All. He will be publishing another book and releasing a new album in 2010. Mr. Corchin welcomes your comments via email. Mr. Corchin is an independent contributor so his views and opinions do not necessarily represent those of Marching.com. Text by DJ Corchin. Illustration by Dan Dougherty. 2010 © The phazelFOZ Company, LLC.